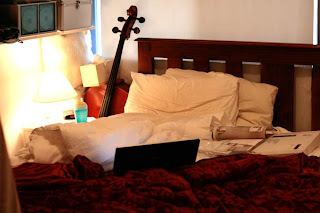 For the past few days, this has been the centre of my world - my cosy bed. My laptop plugs in right next to me, I sit my morning coffee on my bedside table (not Ash's milk bottle as in this pic), I get stuff done in comfort and warmth with small children intermittently climbing all over me. It has the benefit of being able to lie down whenever my energy becomes too depleted to function. Don't get me wrong, I've gotten up - first thing to get the kids toast and milk, at other times to fold washing, do dishes, take my medicine, make afore-mentioned coffee. On Wednesday afternoon I even took the kids out to the shops, which I deeply regretted half an hour into the experience. But I've been so tired from this head-cold, my left ear has been blocked for 4 days now (today is the 5th), that bed has been the only thing that gets me excited. Today I am feeling a bit better, physically and emotion- ally, though my head is still stuffy, I am up and dressed, and actually feeling kind of motivated. At least until I run out of energy ;) I got early mail today, around 8am (bizarre), including a new issue of my favourite-est magazine Real Living, yay! 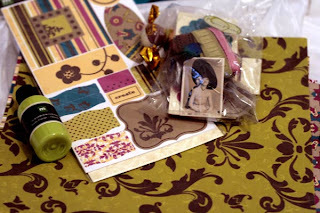 Then at about 9:45 I got a parcel delivered for a DT assignment - this fab kit from Paper Pesto! 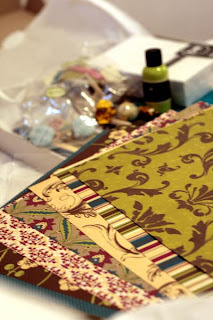 All this Making Memories Funky Vintage goodness has me really wanting to scrap today. 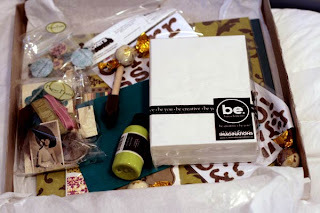 Also some really fun new papers from Rouge de Garance got delivered yesterday to Kiti Q and to me - thanks Kell! - and I have already stuck photos on two of the Urbaine papers, ready to finish into complete layouts. I want to say THANK YOU for all the lovely emails, chats and comments I've received this week - dark days come and go, but it touches me deeply to see the empathy and support that bubbles forth in response to a very small paragraph about not feeling great. I always have that thing of assuming my emails etc annoy, or mean little, to the recipient, whereas their communications mean a lot to me - that double standard that some of us apply (negatively) to ourselves. If you know what I mean. So it astonishes me and warms my heart (it feels like a literal thawing out and warming up, despite being a kind of cheesy saying, just as a black or empty heart also feels so real in my chest) to be the recipient of such caring thoughts. Thank you. glad you're feeling better! have a good weekend! Just noticed in the corner of your room. Is that a Cello? Do you play?